The program was scheduled for two years of funding but is currently slated for suspension from April 2018 to July 2018 because it was too successful. What? Yes, the program was wildly successful, and there is a funding gap for 2018. Up to 3.2 million dollars passed into the hands of farmers, markets, and cooperatives in MA last growing season. The population this program is serving is the most vulnerable in MA. Low income, working families, the elderly, and anyone whose income sources are not sufficient to put enough food nor fresh veggies on the table. White pasta is pretty inexpensive, and by comparison, fresh broccoli, peppers or spinach are not. Email: I cannot stress this enough: Every. Call. Counts. The more that the administration and legislators hear from farmers and your customers that this program needs to be consistent in order for it to work, the better chance we have of getting the resources we need to sustain it. 2. Call or email the governor’s office at 617-725-4005 and ask to speak to constituent services, or use this form. Explain what the suspension of HIP will mean for your business. Urge them to consider funding in a supplemental budget to fill the gap between the suspension and the new fiscal year. 3. Call or email your legislators (find their contact info here). Explain what the suspension of HIP will mean for your business. Urge them to consider funding in a supplemental budget to fill the gap between the suspension and the new fiscal year. 4. Ask your customers to weigh in about the importance of HIP to their families and communities. Share this link with them. Put it on Facebook, Twitter, your email communications with your customers, whatever works. 5. Come to HIP Lobby Day on 3/1 at the state house. Email winton@mafoodsystem.org for details. 6. Invite a legislator to visit your farm or market. 7. Write a letter to the editor or op-ed piece for your local newspaper, explaining the importance of HIP to your farm and your community. 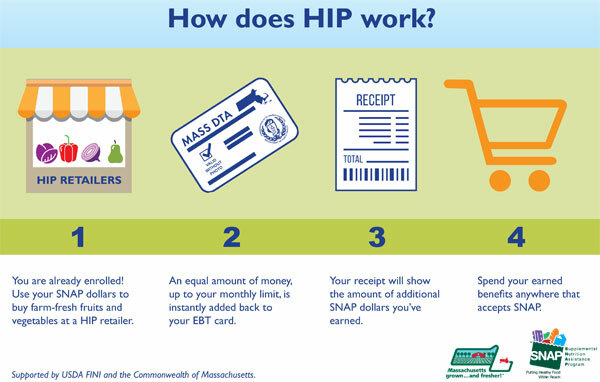 Thank you for doing your part to help MA residents through the continuation of HIP. This entry was posted in Member Stories, News and tagged coop, CSA, farmers markets, hip, legislation, ma low income support, snap by Jennifer Moore. Bookmark the permalink.